Made of polypropylene with only 1/4 inch by 3/8 inch holes, Green Vista's Deluxe Bird Barrier Net / Netting is designed to prevent birds, deer and other animals from eating and destroying ornamental plants, flowers, vegetables and fruits. This versatile netting also has many additional uses. Cover a pond or different water feature with it to protect koi and other fish from herons, raccoons, cats and more predators, and to safeguard water plants from pests. It keeps tree leaves and other debris out of waterscapes, too, saving you cleanup time in fall and winter. It also keeps patios and porches free of debris. Using this netting is the humane way to prevent birds and other kinds of pests from eating and damaging various plants, from vegetable garden plants and pond plants to bushes and trees. The netting deters animals rather than harming them. Because this net is 1/4 inch mesh, it prevents animals from getting to the fruit, vegetables and leaves it protects. This deluxe bird barricade netting is UV treated to give it a longer life. The treatment helps it resist degrading from exposure to ultraviolet light. The net can last 10 to 15 years for most uses. Put Green Vista's Deluxe Bird Barrier Net/Netting to work in your yard. Click "Add to Cart" now. PROTECTS VALUABLE PLANTS FROM BIRDS AND OTHER PESTS: Protect your prize plantings and all your hard work from destructive birds, scavenger animals and other pests with Green Vista's Deluxe Bird Barrier Net / Netting. A polypropylene mesh, it is the humane way to deter deer and small animals from feeding on and harming trees, bushes, fruit and flowers in your yard and garden. The net is 12 feet by 30 feet. HAS MANY OTHER USES: This is a versatile utility net. Besides using it to protect plants in your landscape and gardens, cover your pond with it. 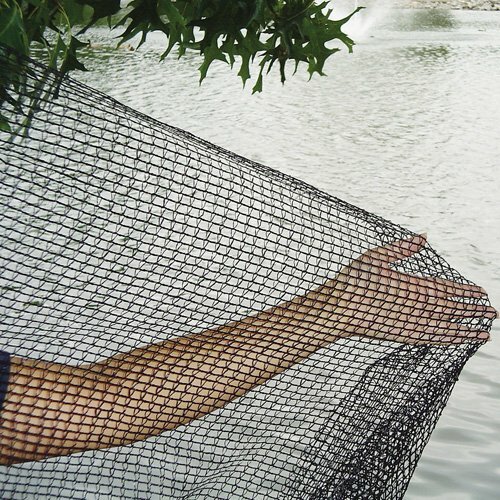 The net helps to protect pond fish and plants from predators while it keeps out leaves and other debris. ALLOWS AIR CIRCULATION: The 1/4 inch by 3/8 inch mesh of this deluxe netting lets air pass through for ventilation. Therefore, the plants and other objects the net covers can "breathe" while receiving protection. RESISTS CATCHING ON BRANCHES: Because the mesh is small, it does not catch easily on branches. That quality makes this netting easier to use. FEATURES UV RESISTANCE: This deluxe bird barricade netting has been treated to ward off ultraviolet light's effects. The net can last 10 to 15 years for most applications.